Join us on a magnificent and extra ordinary Safari Tour as we go in search of the Turtles ( Logger Head & Leather Back ) along the iSimangaliso Wetland Park beach not only is iSimangaliso Wetland Park a World Heritage site but the very first of its kind in South Africa. You will be picked up from your accommodation in St Lucia and travel by Open Game Drive Vehicle to Cape Vidal this 28 km stretch is within the game reserve and one has the added benefit of witnessing various wildlife en route including the possibility of Leopard. Once you arrive at Cape Vidal your ranger will give you a introduction and steps to follow when coming across a Turtle how to photograph and how to approach these protected species needs to be adhered to at all times. The Turtles one may witness on these outings include Logger Head's and Leather Back's its a majestic and spine chilling experience. Watch as the females prepare their nests and then endeavour to lay their eggs. Did you know that only the females will ever touch ground and that the males once born will never again go aground in their lives. Also did you know that the females will always return to the very beach that they where hatched from never mind where in the world they are. Times vary according to tides and the duration is approximately 6/8 hours. A light dinner and refreshment's are included on this Turtle Tour Safari. The LeatherBack Sea Turtle is the largest of all Sea Turtle's and also happens to be one of the largest reptiles on Earth. These amazing and incredible creatures may vary in size from 1.2 - 2.4 meters in length and may weigh an impressive 225 - 900 kg. The LeatherBack Turtle is the oldest Turtle and has been around for 150 million years. 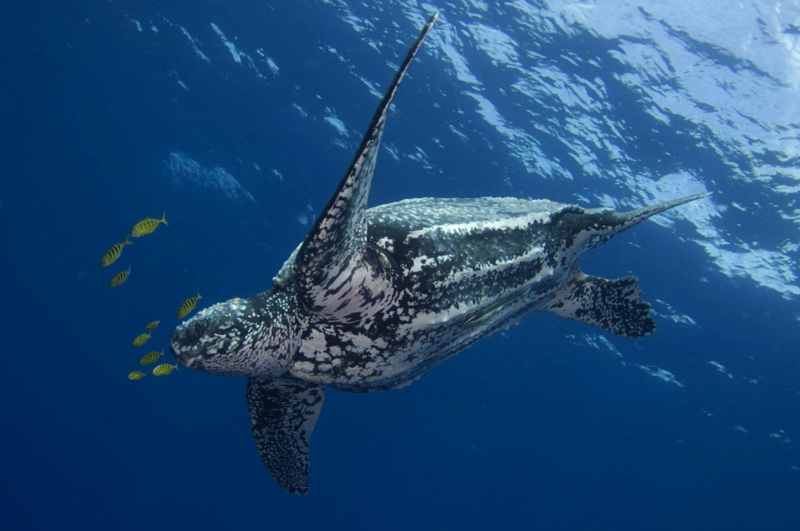 LeatherBacks can consume twice their body weight daily. feeding exclusively on soft-bodied invertebrates like jellyfish and tunicates. They do not have a carapace (shell). The Loggerhead Sea Turtle gets its name primarily due to its large head that looks like a Log. Large reddish hard Shell. Four flippers with 2 claws on each. With powerful jaws they consume critters such as clams, crabs, mussels and sea urchins. Believe it or not, every two or three years, a female turtle may travel over 12,000km back to the beach where she hatched as a baby. As you travel through the iSimangaliso Wetland Park, towards Cape Vidal from where you will venture on the beach you too will be afforded the chance of enjoying other wildlife to and from the beach. Being a world heritage site some of the animal night life may include sightings of Leopard (Nocturnal Animal), Hippos, Kudu, Buffalo, Honey Bagger's and more. Distances include 28 km tarred surface from St Lucia to Cape Vidal. From Cape Vidal travel by vehicle up towards Leven point a 27 km distance on the beach and then back to St Lucia. It is truly a marvelous and incredibly exciting outing. Please note that all Turtle Tour Safari's are weather dependant. All departures are also Tide dependant. All rangers have numerous years of experience in offering Turtle Tours. Please adhere to all rules and regulations especially with regards to photographing Turtles. All Turtle Tours are conducted in Open Game Drive Safari Vehicles. Please take a jacket alone as weather conditions do vary and even though it is during the summer months conditions may change.